BACKGROUND: Not enough is understood about patients’ views of chiropractic care. The aims of this research were to explore patients’ experiences and expectations, their perceptions of benefits and risks, and the implications for chiropractors’ continuing fitness to practise. METHODS: Survey questions were formulated from existing literature, published guidance on good practice from the General Chiropractic Council, and from 28 telephone interviews and a small focus group with chiropractic patients using a semi-structured topic guide. In its final form, the survey elicited patients’ ratings on expectations regarding 33 aspects of care. In a national cross-sectional survey, a number of sampling methods were required as a consequence of the low practitioner response rate. RESULTS: In total, 544 completed questionnaires were received from chiropractic patients, a lower response rate than expected (8%). The two main benefits that patients reported regarding their chiropractic care were reduced pain (92%) and increased mobility (80%). Of respondents, 20% reported unexpected or unpleasant reactions to their treatment, most commonly tiredness or fatigue (32%), and extra pain (36%). In most cases they expressed low levels of concern about these reactions. 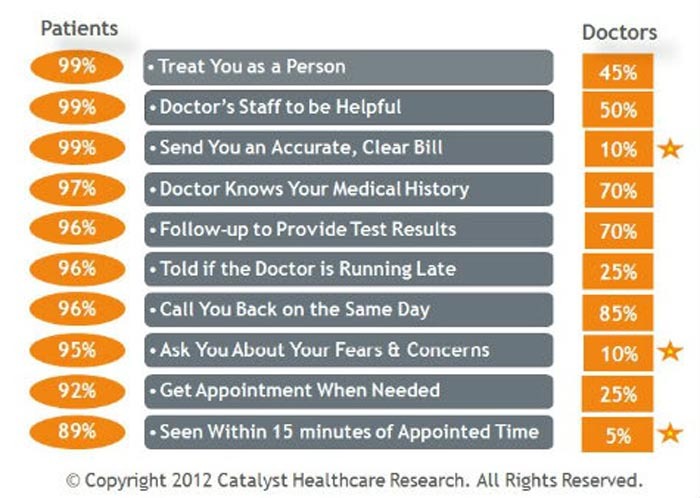 Patients’ expectations were met for most aspects of care. The four aspects of practice where expectations were least well met comprised: having more information on the cost of the treatment plan at the first consultation (80%); the chiropractor contacting the patient’s general practitioner if necessary (62%); having a discussion about a referral to another healthcare practitioner (62%); and providing a method for confidential feedback (66%). OBJECTIVES: The purpose of this secondary analysis was 1) to examine patient expectations related to a variety of common interventions for low back pain (LBP) and 2) to determine the influence that specific expectations about spinal manipulation might have had on self-report of disability. METHODS: We collected patients’ expectations about the benefit of specific interventions for low back pain. We also collected patients’ general expectations about treatment and tested the relationships among the expectation of benefit from an intervention, receiving that intervention and disability-related outcomes. RESULTS: Patients expected exercise and manual therapy interventions to provide more benefit than surgery and medication. There was a statistical association between expecting relief from thrust techniques and receiving thrust techniques, related to meeting the general expectation for treatment (chi-square: 15.5, P = 0.008). This was not the case for patients who expected relief from thrust techniques but did not receive it (chi-square: 6.9, P = 0.4). Logistic regression modeling was used to predict change in disability at treatment visit 5. When controlling for whether the general expectations for treatment were met, intervention assignment and the interaction between intervention assignment and expectations regarding thrust techniques, the parsimonious model only included intervention as the significant contributor to the model (P < 0.001). The adjusted odds ratio of success comparing thrust techniques to non-thrust in this study was 41.2 (11.0, 201.7). BACKGROUND: Individuals’ expectations on returning to work after an injury have been shown to predict the duration of time that a person with work-related low back pain will remain on benefits; individuals with lower recovery expectations received benefits for a longer time than those with higher expectations. The role of expectations in recovery from traumatic neck pain, in particular whiplash-associated disorders (WAD), has not been assessed to date to our knowledge. The aim of this study was to investigate if expectations for recovery are a prognostic factor after experiencing a WAD. METHODS AND FINDINGS: We used a prospective cohort study composed of insurance claimants in Sweden. The participants were car occupants who filed a neck injury claim (i.e., for WAD) to one of two insurance companies between 15 January 2004 and 12 January 2005 (n = 1,032). Postal questionnaires were completed shortly (average 23 d) after the collision and then again 6 mo later. Expectations for recovery were measured with a numerical rating scale (NRS) at baseline, where 0 corresponds to “unlikely to make a full recovery” and 10 to “very likely to make a full recovery.” The scale was reverse coded and trichotomised into NRS 0, 1-4, and 5-10. The main outcome measure was self-perceived disability at 6 mo postinjury, measured with the Pain Disability Index, and categorised into no/low, moderate, and high disability. Multivariable polytomous logistic regression was used for the analysis. There was a dose response relationship between recovery expectations and disability. After controlling for severity of physical and mental symptoms, individuals who stated that they were less likely to make a full recovery (NRS 5-10), were more likely to have a high disability compared to individuals who stated that they were very likely to make a full recovery (odds ratio [OR] 4.2 [95% confidence interval (CI) 2.1 to 8.5]. For the intermediate category (NRS 1-4), the OR was 2.1 (95% CI 1.2 to 3.2). Associations between expectations and disability were also found among individuals with moderate disability. BACKGROUND: The mechanisms thorough which spinal manipulative therapy (SMT) exerts clinical effects are not established. A prior study has suggested a dorsal horn modulated effect; however, the role of subject expectation was not considered. The purpose of the current study was to determine the effect of subject expectation on hypoalgesia associated with SMT. METHODS: Sixty healthy subjects agreed to participate and underwent quantitative sensory testing (QST) to their leg and low back. Next, participants were randomly assigned to receive a positive, negative, or neutral expectation instructional set regarding the effects of a specific SMT technique on pain perception. Following the instructional set, all subjects received SMT and underwent repeat QST. RESULTS: No interaction (p = 0.38) between group assignment and pain response was present in the lower extremity following SMT; however, a main effect (p < 0.01) for hypoalgesia was present. A significant interaction was present between change in pain perception and group assignment in the low back (p = 0.01) with participants receiving a negative expectation instructional set demonstrating significant hyperalgesia (p < 0.01).